If you watched today’s interview with Motorola’s CEO Dennis Woodside, which was conducted by our buddy MKBHD, you might have heard that the release of the Moto X with wood backs was coming “very soon.” Soon is the worst word ever, given that it actually doesn’t mean anything in terms of when a release will actually happen. Soon could be within a month or even as long much as a few months. Thankfully, @evleaks has everyone’s backs and has took to his Twitter account to show off a couple of newly-leaked photos of these splendid looking devices. 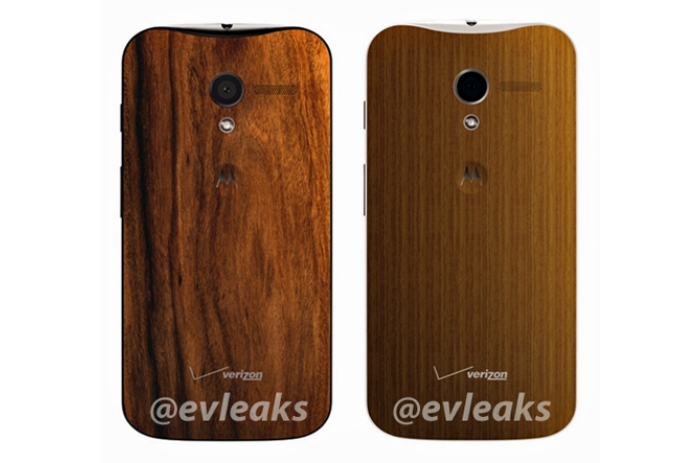 What is even more neat is that this is the first look at the devices with Verizon’s logo on the backside, and they actually don’t look all that bad. Let’s just be thankful they didn’t decide to slap a huge 4G LTE logo on there as well. Knock on wood. Evan clearly knows we have been dying to see more of the wood back action, so we are more than excited for these to finally be launched by Moto.